Wednesday was National Signing Day for college football’s recruiting class of 2019. 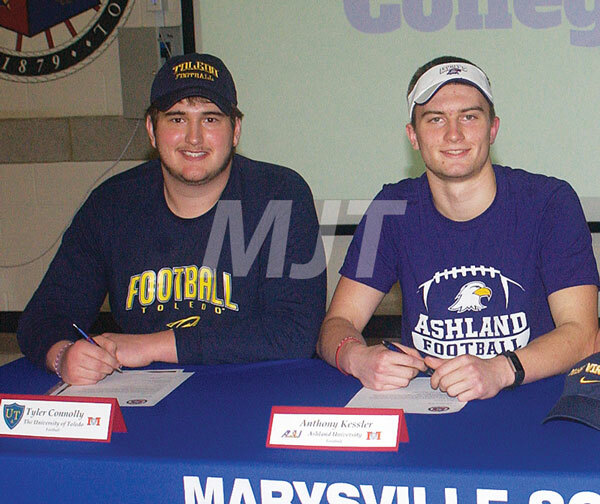 A pair of Marysville High School athletes signed to continue their gridiron careers. They are from left, offensive-defensive lineman Tyler Connolly (University of Toledo) and tight end-wide receiver-defensive end Anthony Kessler (Ashland University). High school senior football players from around the country took time on Wednesday to write their names on the dotted line during National Signing Day. In doing so, they decided where they will continue their gridiron careers on the collegiate level. Marysville High School’s football squad will send two more players up the ladder. Tyler Connolly, a 6-6, 305-pound offensive-defensive lineman, signed with the University of Toledo. Anthony Kessler, a 6-4, 185-pound defensive end-tight-end-wide receiver, inked papers for Ashland University. For Connolly, Wednesday’s signing finally brought an end to his recruiting odyssey. The All-District honoree had originally planned to sign with the University of Akron during December’s early signing period. The Zips, however, fired coach Terry Bowden after the 2018 season. A new head coach came in and began to review Bowden’s commitments. Connolly’s signing was delayed and that gave him time to look for greener pastures. “I started talking to other schools after that,” said Connolly. “I met with the offensive line coach at Toledo on one visit and the recruiting coordinator on another trip. “It’s been a long process for Tyler,” said Monarch head coach Brent Johnson. “However, he’s worked hard to play in the Mid-American Conference (MAC). This is a credit to his work ethic. Connolly played the 2018 season with a right shoulder problem (torn labrum) that required surgery after the grid campaign concluded. The injury prevented him from competing during his senior season in wrestling. Connolly said he’s pretty certain he will be red-shirted by the Rockets next fall. Although he won’t be able to take the field under that status, Connolly’s okay with the anticipated decision. Connolly said he plans to study education or sports management, with the goal of one day becoming an athletic director. As far as going from recruitment by one MAC school to signing with another, the lineman said he’s fine with that as well. Kessler had looked at a handful of other schools before deciding on Ashland. Kessler, who will study criminal justice and forensics, said Ashland’s coaches told him that he will spend the 2019 campaign on the school’s junior varsity squad as a defensive end-tight end. “I will have the opportunity to work my way up from there,” he said. Kessler, who also runs sprints and hurdles for the MHS track team, said he will begin following Ashland’s weight training program in a few weeks. “I already work out every day,” he said.